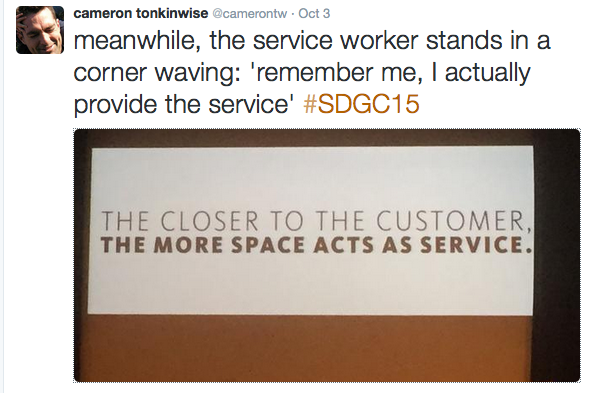 I was lucky to attend the recent SDN Global Service Design Conference. The last time I attended this conference was in Paris in 2011. There were 600 people at the conference in New York, testimony to the fact that Service Design is a growing design discipline. The presentations and workshops were of a very high quality and it was often challenging to decide which sessions to go to. There was a lot of discussion about service design in the public sector with case studies from all over the world which I found very refreshing. A lot of resources is spent on public services. Interestingly, in the USA 42.7% of GDP is spent on government. Below I have noted some notes and reflections from various presentations. There was also a lot of discussion about focusing on design implementation, the employee experience and supporting customer-centric organisational change. Service design is very much a team sport. By making everyone more person-centred we will get better and more human service outcomes! I have been thinking about how designers can support design implementation and it was so great to see how organisations are doing this and supporting customer-centric organisational change. I STRONGLY believe that this needs to be the focus for organisations. Customer-centric organisational transformation is key! Customer experience is about value exchange. It becomes remarkable when organizations can create deeper bonds, more value, and more engagement with customers. Billi proposed a three part model to consider customer experience and discussed how a few innovative organisations deliver on these components. Trust – $1m host guarantee / they send professional photographers out to take photos of hosts home. They support you to win. A team leader , designer, architect, writer, engineers, strategist, producer working with agile scrum teams. Design studios are located in core hubs globally, through the hubs they are creating a global studio network. Interestingly Munib Karavdic from AMP discussed that they were also creating cross-disciplinary project teams relying who use design thinking approaches for projects (detailed below). Christian ran Mind Lab and is an expert in Design within Government. At the Danish Design Centre they are working with start-ups. Introducing them to design processes and hiring ethnographers to research their journey. The government funds new businesses to work with the centre. They aim to experiment with actual businesses, learn and share, giving insight into design approaches and innovation. Christian talked about the importance of the design community sharing failures as well as successes so we can grow the discipline and improve our practice. Christian contrasted the thinking about design of scholars Herbert Simon and Buckmeister Fuller. Herbert Simon talked about design as decision making and problem solving. Buckmeister Fuller saw design as future making and visioning. Rather than design providing decision options, it shows what the future can look like. Bland and Collopy were mentioned as well, framing that design is about opportunity. Christian stressed that design should move the focus from which decisions should we make to what should we make a decision about. Context is key i.e. the organizational context is extremely important within service design. Design implementation is a team sport requiring organizational change. From his experience, within large transformation projects a percentage of staff leave or get made redundant. They don’t always fit in the new vision. Working with the right managers and staff is key for success for service design implementation. #enacting new practices – ability to make things concrete. Managers need to be OK with tge questions could we get a working prototype in 25 days? We need to get the design DOING into design thinking. Bring the designers in the organization as they are skilled in DOING. Designers need to get better at documentation. We need more reflection in organisations and qualitative and quantitative metrics to support reflective processes so that we can learn and refine our practice..
Dr. de Leon from RCA talked about the importance of MBA literacy for designers and how at the RCA design school they include compulsory business courses for design students. Service Design in government needs to focus on aligning policy and practice not making policy decisions on the roof and some poor person has to go and implement the policy in practice. Design needs to be working at the policy level. Service Design needs to inform whether the policy itself is right by bringing complimentary big and little data together….working from both ends. The designer’s role is changing to a midwife. We are not magicians. Designers make options to make decisions about. It needs to function on the policy perspective and not only on the interaction perspective. 4 levels of impact of design within the public sector – a continuum from discreet problems to policy interventions. Munib and Joe talked about how organisations often spend their energy on solving the wrong problems. They used a great analogy “nice landing – wrong airport” to describe projects that come in on time and on budget but do not solve the right problems. At AMP they focus on building the ‘customer case’ not the business case in the beginning of projects. Business cases needs to come later. Like Citi, they too are trying to spread design-led innovation throughout the organization. They talked about their ‘implementation pods’, which consist of co-located groups of people. These pods include both a design lead and a business lead. 2. Physical space. Co-location in a physical space with white boards etc. It feels different and looks different which leads to behaviour change. No board room presentations, this is the project space and the executives come to the space for standup meetings which drives speed to market. 3. Common approach and tools. There is no hand-over in this process as there are the right people on the team. The core team are involved in the whole journey from design to implementation. The design lead leads more at the start, and the business lead leads more towards the end. Their focus is on enabling the pods by training people, which allows for new language within the organization. Senior leaders have ‘design partners’ that work with them. They are not trying to turn the whole organization into designers but rather to establish a common design language. It is creating a new risk appetite / outline leaderships risk tolerance / placing smaller bets in the market / high fidelity front-end low fidelity back end / they measure ROL i.e. return on learning as a metric. There is radical transparency and because they use agile, also a lot of new products. They work for a large organisation that looks after all aspects of verteran affairs. As you can imagine their clientele is incredibly diverse. Organisations need to focus on empowering and enabling employees to deliver great customer experience. They talked about their exploration of how to support their staff better. These were accessible and easy for everyone to understand. They successfully got these design tools being used as tools broadly. These tools helped staff understand who their customers were and how they were accessing the different services. The clearly showed that who the customers were and how they were accessing services differently. HCD training helped deeply embed Design into the culture. Although it should not be training for training sake but needs to be attached to real projects so it does not become an abstract thing. It was great to hear Cameron’s critical commentary. All service design is ‘learning design” but we don’t think enough about staff. Service design is always about transitioning people, creating different value constellations and different relationships. Why aren’t we more focused on staff?! We really do need to be. We need to be thinking about organizational change! Alex was involved with customer experience for the ‘London Olympic experience’. As he as brought in too late to do the design he focused on the operational side of things. Continuous customer feedback was at the core allowing for continual improvement with the help of spectators. EACH DAY a daily report was circulated widely letting staff know how they were doing so they could make adjustments. Even on the final day. An example was asking people one word that describes your experience presented as a word cloud. He called this “quant experiential”. They also used social media monitoring, using geo-location they knew where the tweets were coming from, learning about what works what doesn’t. This allowed them to stay on top of issues so that people had a good experience. We need to be thinking about organisational culture including hiring / on boarding – training/ mentoring / communications/ incentives/ KPIs / work environments. Sticky notes don’t make organisational change! Most organisations are now looking to transform. Service Design needs to help. We can learn from organizational change theory. She likes a three part organizational change model. All three parts need to function as an iterative and longitudinal cycle as an organizational journey. 1. Insights. From lots of data sources where the problems are. Where do you make promises to your customer? Go measure how you are doing. Continuously. 2. Actions. Make changes/ iterate / measure. 3. Communication. Communicate change and the why. We need to be thinking about how can we design the transformations our organisations are going through.